Paul Nuttall has said he never doubted that UKIP would be "vindicated" on immigration and security issues. Speaking three days after seven people were killed in the London Bridge terror attack, he said he was "only sorry that this vindication has come too soon and has involved so much blood being shed". He said authorities must be able to close down mosques where certain extreme versions of Islam are preached. He would also consider internment for terror suspects, he said. Mr Nuttall told supporters "if a new muscular no nonsense approach" replaces "political correctness... then we will have a better chance of preventing another Manchester or indeed another London Bridge in the future". He claimed his party had "set the agenda as before on Brexit and immigration - but we have also marked out new priorities for our country and we've been the one party with the guts to tell it how it is on integration and security too". He hit back against other parties' comments over UKIP's approach, saying he "utterly" rejected the idea that their "integration agenda is in any way Islamophobic or divisive". "It is about bring communities together and ensuring that community cohesion is improved," he said. "And I predict that history will prove that UKIP was ahead of its time in highlighting these issues." 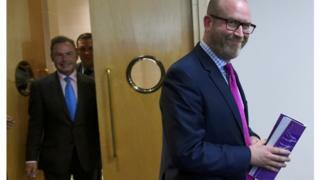 Mr Nuttall branded the prime minister "complacent at best" during her time as home secretary, but said his criticisms of her "pale into complete insignificance in comparison to the prospect of Jeremy Corbyn or a Diane Abbott government". Earlier Mr Nuttall told LBC the government should consider extending police powers to detain suspects without charge from 14 to 28 days - powers that were reduced in 2011. He also predicted a possible return to Control Orders, which allowed suspects to be held under what amounted to house arrest. "When MI5 tells us there are 3,000 suspected Jihadis - and another 20,000 just below that - then I think we've got to realise we've got a potential problem," he said. Would-be Jihadis who support or fight for so-called Islamic state should have their passports revoked and never be allowed back into the UK, he said. Asked about his views on internment, Mr Nuttall replied: "I would do anything to ensure British families - British men, women and children are kept safe - that's paramount and I would put that over the human rights of any would-be Jihadi." The UK leader said mosques "preaching hatred" or found to be "promoting the values of Islamic State" have no place in the UK, adding: "And I guarantee that the vast majority of Muslims in this country would agree with me. "Unfortunately there's a tiny number of people within that community, who hate who we are, hate the way we live, hate our democracy and as we've seen on Saturday night - actively want to kill us. They are a cancer and they need to be cut out." The UKIP leader also called for the government to reverse the cuts to police numbers (nearly 20,000), to put 4,000 more people into the border force and 7,000 more prison officers. He says "radicalisation is rife in prisons". Mr Nuttall said he would not be under pressure to step down if he won no seats on Thursday, noting that UKIP was at its "most influential, [when] we didn't have an MP" and Nigel Farage still remained leader. He would not say how many seats he hopes to win, but predicted, "we'll get over the line in a number of seats, but our vote share will go down".